Standby Deliver – consists of steel plates facing each other and moving back and forth attached to activating motors. Underneath is a lit glass sugar molecule. 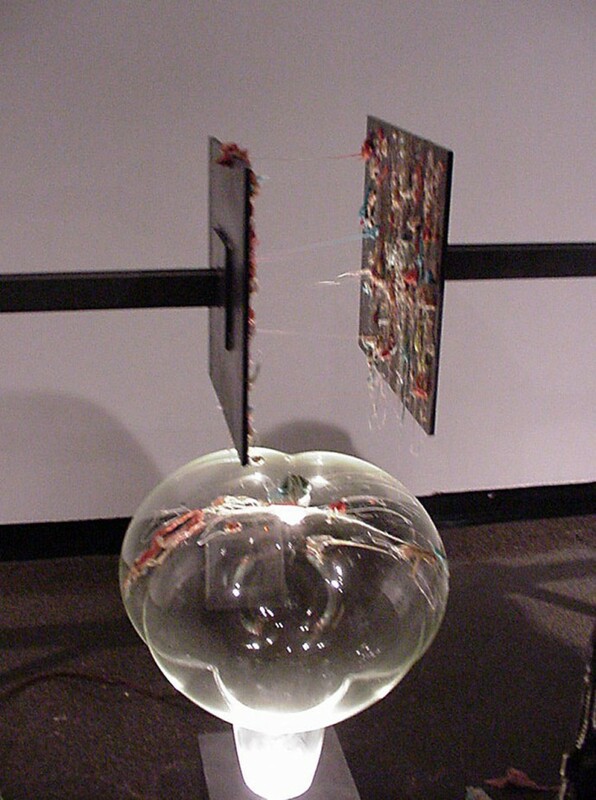 Visitors have access to chewing gum, which they chew and stick to the chewing plates, which will stretch out, creating long colorful strings of the sticky substance. 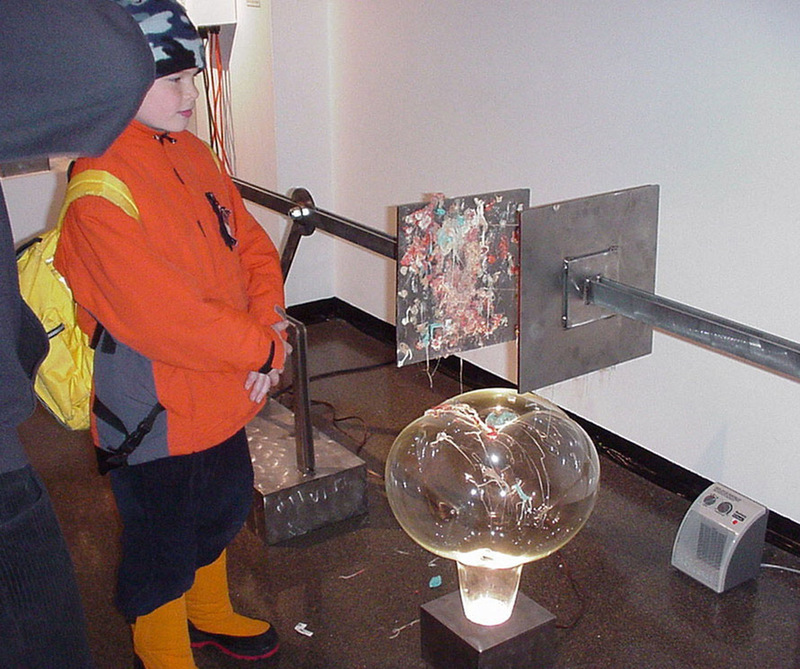 After many cycles of the plates back and forth motion, the glass sugar molecule is coated with the colorful goo. Standby Deliver by Ken Rinaldo THE ART INSTITUTE OF CHICAGO , Betty Rymer Gallery, Chicago Illinois. 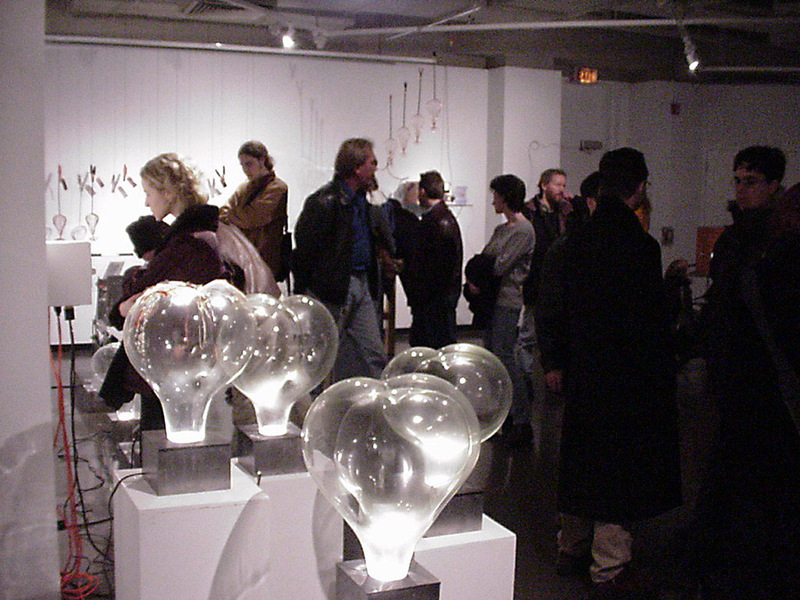 Jan. 1999 IN:FORMATION Exhibition curated by Sine::Apsis Chicago artists’ collective. This human activated system uses sugar, gum and machine as metaphor for human consumption and waist cycle while offering mouth and eye candy to help the participant question the impact of their addictive consumerist behavior and the sugar tweaked cognition that results. The origin of this piece is based on obsessive consumer behaviors, including my own. I admit freely to being a sugar addict (now and again). My consuming behavior can have me chewing 4 packs of gum in a matter of 50 minutes. I usually get spearmint, peppermint, fruit and cinnamon, which I end with. The cinnamon flavor seems to be all I can taste after the other strong preparations. The large gum wad that results is really quite annoying and is partly associated with the accidental wads found on the bottom of my shoes or my pant knees from the underside of school desks. Gum base seems to coat everything in the modern city and is probably as prevalent as cigarette butts as the most common artificial sidewalk flora. I am often amused by Taiwanese laws forbidding the consumption of gum in their clean city and wonder when class action suits will charge Wrigley to clean up our side walks and public benches. My solution to the unsightly wad that results is to put them in sheets of white or black paper. I would often pull the paper open and find that the patterns were quite beautiful, like 3 dimensional Rorschach tests. Often I would make collages with these bits of gum, but had never seen them as precious enough to save; they invariably end up in the garbage after a blood sugar low, crash and burn. As I would ponder these Rorschach-test-gum-vignettes, I would wonder if all the sugar in my body and brain were effecting my perception of their beauty. Was the sugar addiction driving the mouth candy to become eye candy? I am always amazed that the first ingredient in gum is sugar and the gum rubber base is just the medium, the delivery system, for this sugar. Somehow gum seems to be the ultimate metaphor for the American consumerist way. Plastic wrap, large containers, cardboard boxes, gum base, etc. which are also just delivery systems, have long-term environmental impacts not often considered. “Standby Deliver”, a machine that involves human participation, will allow me to reference people as part of this machine ? a system of making, consumption and disposal. Their choice of eating and placing it on the work will allow them to consider their complicity in this machine system. 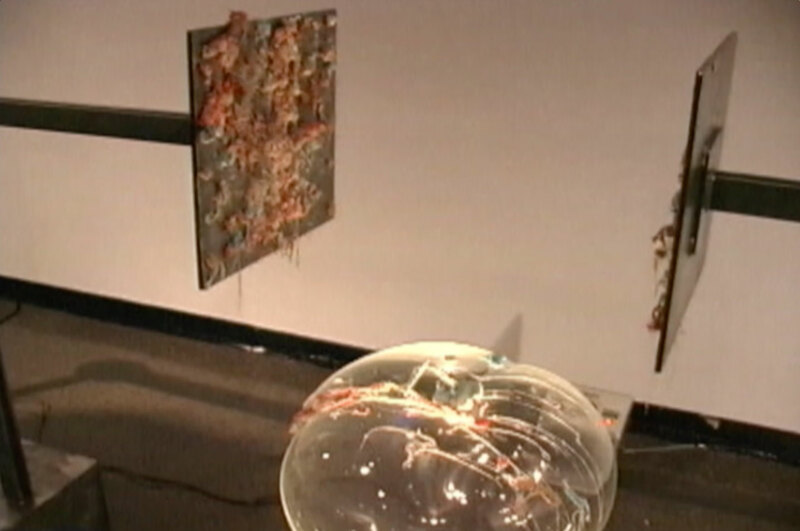 By allowing the viewer/participant to place the gum onto plates, which will stretch the gum onto glass sugar molecule forms, it will help to identify sugar as a primary drug. This may or may not cause people to question the impact of their addictive consumerist behavior, but it will certainly involve them in the act of making, becoming part of the American sugar way and the sugar tweaked cognition that results. 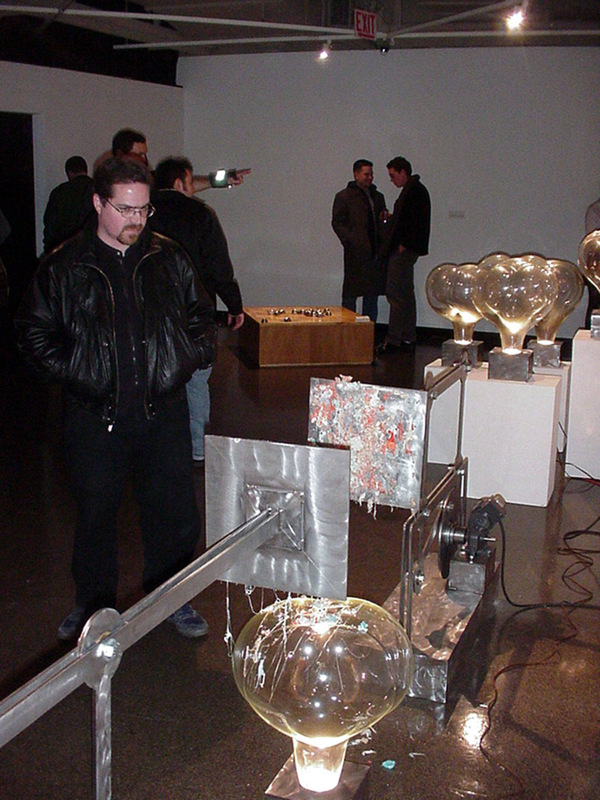 Organic/Mechanic Exhibition curated by Lena Vigna. Displayed Standby Deliver digestive sculpture. 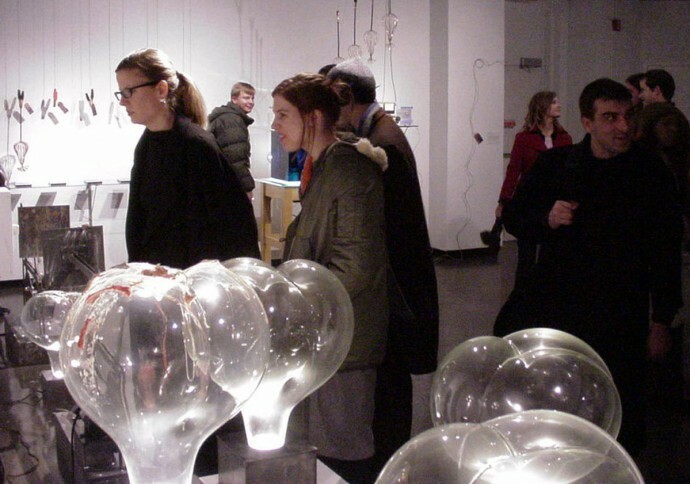 New Works Faculty Exhibition. Displayed Standby Deliver digestive sculpture. IN:FORMATION Exhibition curated by Sine::Apsis Chicago artists’ collective. Premiere of Standby Deliver a digestive sculpture that involved ingestion of sugar and gum. Special thanks to Robert Wiley for research in blowing molds of sugar molecules and the Department of Art The Ohio State University Glass Area. 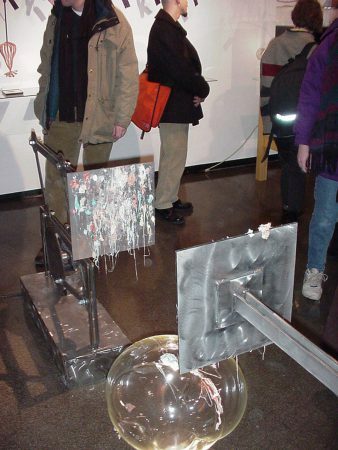 The molds were really very clever and Robert Wiley did this brilliant fabrication.